FCU English Online: Go Climb a Rock! You need to use both your hands and your feet. You can do it alone, or you can do it with friends. This is a popular sport; the number of people doing it is climbing every day. That’s because this sport is rock climbing, and it’s a great way to challenge yourself and find a feeling of accomplishment. Before you begin rock climbing, you should learn the basics of how to protect yourself. 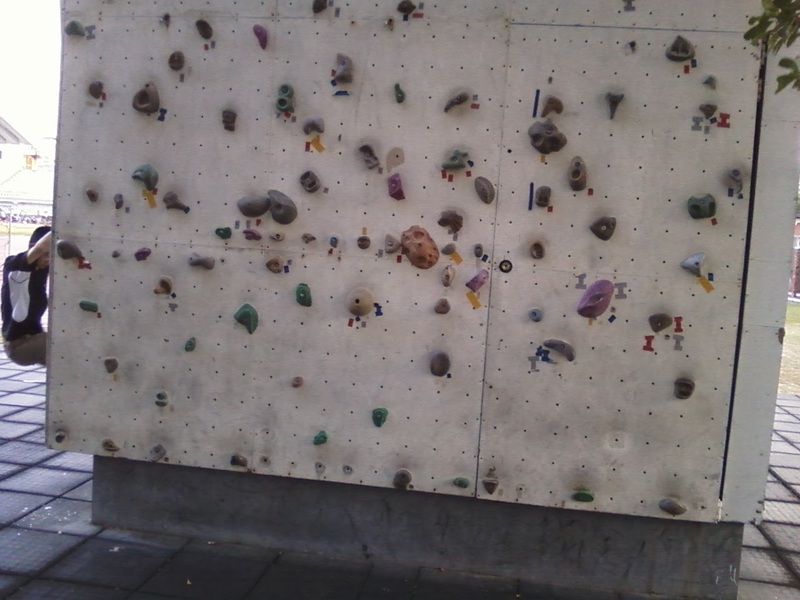 First, when you go rock climbing, you should wear comfortable clothes or sportswear. Next, if you fall down, you should bend your knees so that your body can disperse the force. If you climb with others, they should work hard to strengthen their hands so they can help you by holding a safety rope. Finally, if you climb alone, you shouldn’t climb higher than one meter from the ground. Follow these basic rules and you will be ready to begin. There are some easy ways for beginners to challenge themselves. 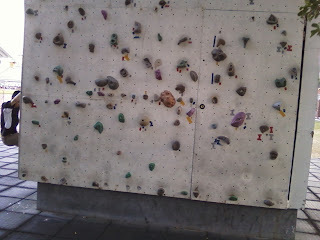 Beginners can try to climb a horizontal route and move either from right to left or from left to right. If you are climbing on a cylindrical rock-climbing wall, you can try to climb in a circular route. Try to climb as many laps as you can. After you have conquered those easy tasks, you can try a more advanced one. For instance, you can climb vertically using safety ropes. You should learn to use these ropes, and know how they can protect you. At the same time, you have to know how use other tools and equipment as you climb higher. You should pay attention to your instructor and learn techniques and safety procedures by heart. When you start to climb vertically, never joke around while someone else is climbing. When you are climbing in a group, you need to be familiar with some simple verbal orders. All orders should be very explicit and loud to inform your partner what to do. It is important that you protect your partners and yourself. 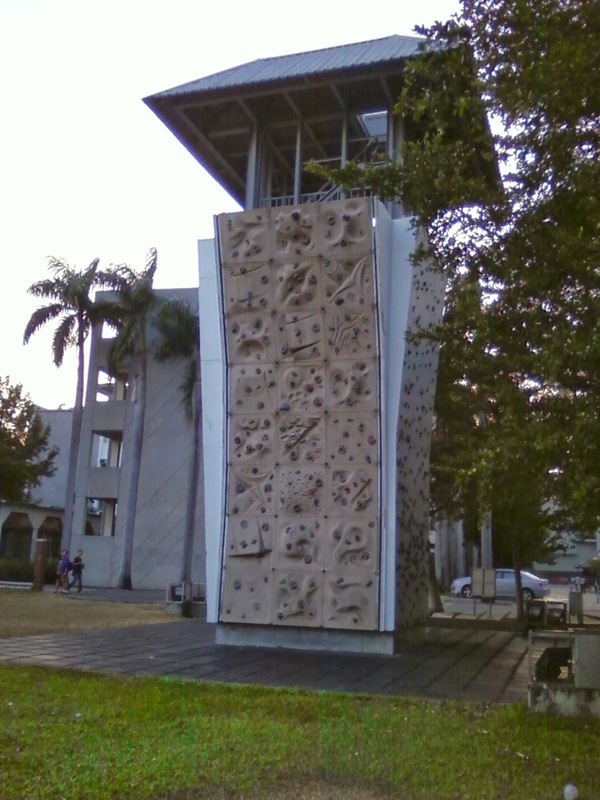 If you live near Feng Chia University, you are lucky because there is a rock climbing wall on campus near the running track. Rock climbing isn’t that difficult; just remember to follow the safety rules for beginners. Be careful and have a good time; I am sure you will find rock climbing an elevating experience!